The Relevance-Analysis checks whether the report material contains information on topics identified as relevant. 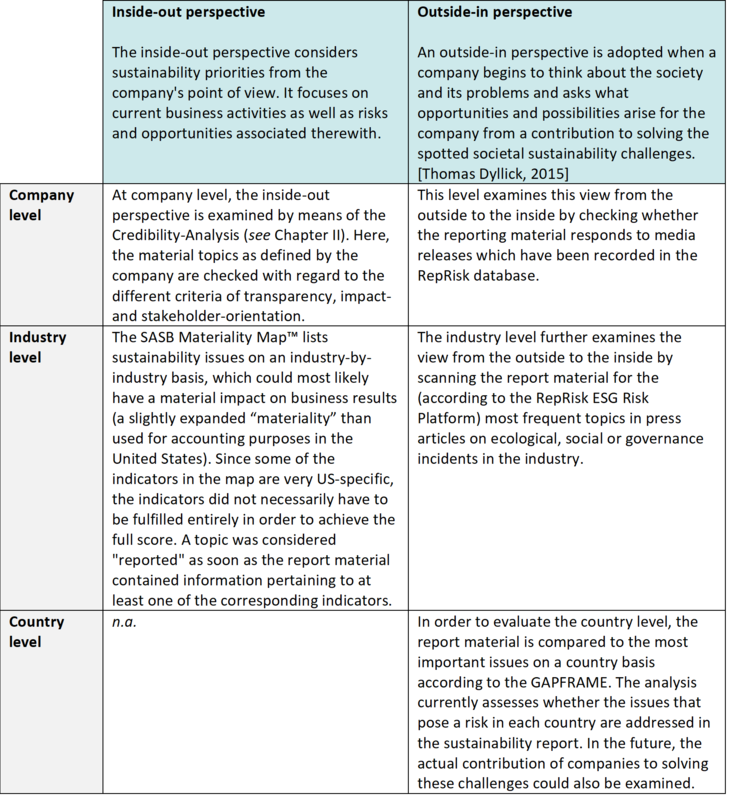 As in the previous year, the identification of relevant sustainability issues was developed using the RepRisk ESG Risk Platform as well as the Materiality Map™ of the Sustainability Accounting Standards Board (SASB). In order to obtain an even more comprehensive picture, it was also investigated whether companies are contributing to the biggest challenges in Switzerland or other countries in which they operate. This part of the analysis was based on the GAPFRAME (www.gapframe.org) of the Business School Lausanne. As a result, the company, industry and country level was analysed. The analysis took into account the inside-out and outside-in perspective per level.